Nigeria is one of the largest fish consumers in the world. Since the demand of fish is increasing continuously, many farmers have started fish farming in small scale for fulfilling their daily family demands or in large scale for making more profit. Commercial fish farming in Nigeria has great opportunities. One of significant factors in fish farming is fish feed which can offer fish better digestion & absorption and better living environment. 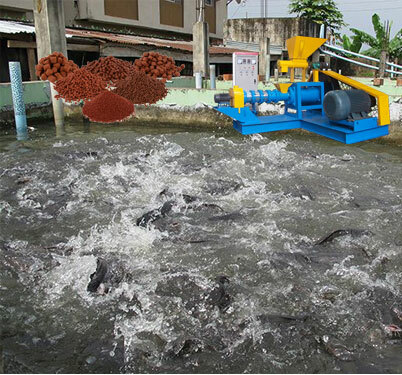 To produce fish feed, lots of fish feed machines in Nigeria are widely utilized in fish farming. Obviously, fish feed machine, the equipment responsible for fish feed production, plays an important role in fish farming. Here let’s have a look at the floating fish feed and feed machines in Nigeria. 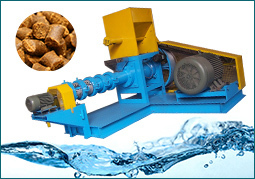 Before discussing fish feed machines, we should have the clear idea of fish feed. Fish feed can be divided into sinking, slow sinking and floating aquafeed according to its buoyancy. Floating aquatic feed is suitable for Tilapia feed, Crucian feed, Ranidae feed, Weever feed etc.. In Nigerian fish farming, the floating fish feed is basically in great demand. 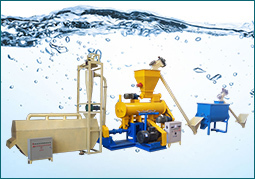 Therefore floating fish feed machines are in strong demand in fish farming. ♦ Collect raw ingredients like maize, cowpeas, groundnut, melon, potato, cassava and so on. ♦ Clean materials to remove impurities and grind raw materials into powdery form with a feed hammer mill. ♦ Feed the powdery ingredients into fish feed extruder to make feed pellets. ♦ Cool and dry the finished pellets with a cooler and dryer or in the sun, then the pellets can be fed to the fish directly. ♦ Packing feed pellets by the package machine(optional). 1. The feed pelleting machine is locally fabricated in Nigeria, which is operated by diesel engine, electricity powered machine or manually. It consists mainly of hopper, housing, screen, base stand and etc.. By cylindrical dies of different diameters, this machine can pellet varying sizes of feed, which depends on the age, size and species of fish involved. Most fish feed produced are a compressed pellet. The quality of feed pellets produced locally is poor in quality. First of all, they are not strictly pellets, since there is no uniform cutting to length, except perhaps manually. Pellet structure is loose and friable because of a lack of compression and cooking in the pelletizer. This type of pelletizer results in almost no compression and absolutely no cooking. They create a smooth looking pellet surface, because holes in the die plate were nicely done and polished, but pellets had no mechanical strength and crushed into dust at the slightest pressure. 2. This dry extruder is operated electrically and it consists of the hopper, barrel, screw conveyor and so on. The feed hopper is welded to a cylindrical base-the barrel, and inside the barrel there is the screw conveyor. The feed ingredients are transported and pressed by the screw leading to a rise in temperature due to increase pressure in the barrel. This kind of pellet machine do not have enough long barrel, so pellets lacks enough cooking and pellets made are easily dissolved floating on water in certain period. 3. Making floating fish feed, extrusion is the vital part. What is extrusion? Extrusion is a high temperature short time (HTST) heating process, it minimizes the degradation of food nutrients while improving the digestibility of protein and starches.it is the only way to make water stable slow sinking or floating feed pellets. Azeus fish feed extruders exported to Nigeria is characterized by good extrusion effect. There are two types of fish feed machines: dry type fish feed machine and wet type fish feed machine. The general extrusion process involves a high temperature over a short time. Temperature higher than 100℃ is needed in order to achieve expansion of the feed as it leaves the die. For dry type fish feed extruder, high temperature is obtained by dissipation of mechanical energy from heated surfaces such as barrel and screw surface, or generated by shear forces between wall an material and screw and material. Under the high temperature, materials begin gelatinization of starches and denaturation of proteins. Then the screw forces materials through the die, where materials is formed and expanded at the outlet of the die. For wet type extruder, the temperature is achieved through preconditioning and steam injection. At the same time the material also undergoes relatively high pressure. The pressure difference in the interior of extruder and the external environment will cause the extrusion of the materials. In modern fish farming, fish farmers must be aware of improved system and machinery before their adoption. 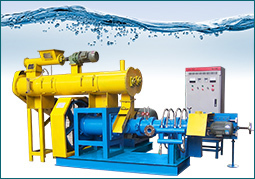 Azeus fish feed machinery is the professional manufacturer of floating fish feed machines. We have provided different models of machines for different capacities and also can customize fish feed machines meet customers’ specific demands. Spare parts, wearing parts and feed formulation are also available. 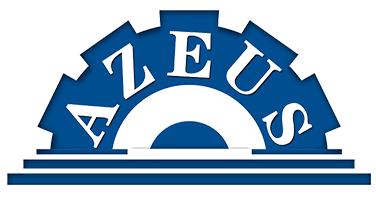 Azeus can continuously provide comprehensive information on the fish feed making machinery to customers.